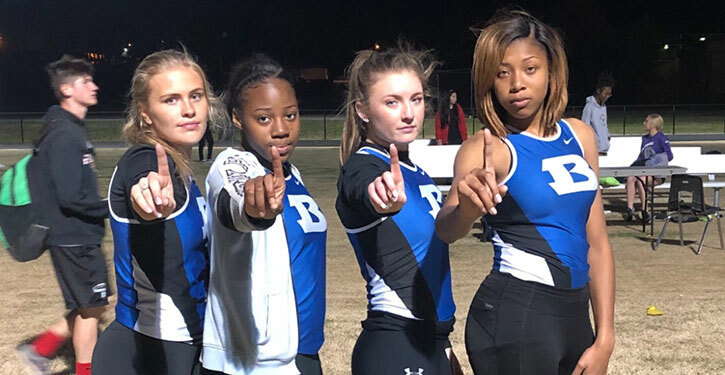 FAYETTEVILLE — Ella Reynolds won the 400-meter run while Megan Lee scored in five events and Deborah Shaw four as the Bryant Lady Hornets finished third overall at the Fayetteville Bulldog Relays on Friday. The Lady Hornets finished with 108.33 points behind only Rogers, first with 175, and the host team with 136.33. Pea Ridge was a distant fourth followed by North Little Rock and Springdale Har-Ber. Eighteen teams competed at the meet. Reynolds ran a 59.10 in winning the 400 to beat out Rogers’ Alexa Wright (59.36). Bryant’s Zhania Hall was fifth in 1:02.21. Reynolds, Hall and Lee helped secure the only other first-place finish for the Lady Hornets, joining Amya Smith on the 4×400-meter relay. The winning time was 4:06.82. North Little Rock was second in 4:12.96. Shaw was second in the high jump, the triple jump and the 100-meter hurdles. She was fourth in the long jump. Shaw battled Georgia Brain of Rogers in two of those events. In the 100 hurdles, Brain won in 15.66 with Shaw right with her in 15.86. In the triple jump, Brain covered 35’10.5” with Shaw second at 35’. Lee was eighth at 32’5.75”. In the high jump, Shaw tied Ella Brandt of Harrison for second, clearing 4’10”. Kynley Burton of Pea Ridge won by getting over at 5’2”. Both Shaw and Lee scored in the long jump. Shaw’s leap went 16’2.5” while Lee was fifth at 16’2”. Lee was third in the 300-meter hurdles, finishing in 47.53. Allison Morse was eighth for Bryant in 51.32. In the 200, Lee ran a 27.39 to place eighth. The Lady Hornets also picked up second-place points in the 4×100. Madelyn Thomas, Smith, Jaiyah Jackson and Mallorie Scott-Smith combined on a 51.00 clocking. They were edged by Fayetteville at 49.82. Smith added a third in the 100 with a time of 12.98. Henriette Bochmann picked up a third-place finish in the discus with a throw of 98’6”. She was fourth in the shot with her toss of 31’10”. The Lady Hornets had three vaulters score in the pole vault, led by Kristin Garner’s third-place finish at 10’2”. Thomas was fifth at 9’2” and Kailey Richardson cleared 8’8” to pick up eighth-place points. Bailey Brazil, Caroline Pelton, Erin Key and Aryn Stiles teamed up for an 11:03.22 clocking in the 4×800, earning a third-place finish. The Lady Hornets are scheduled to compete at the Wampus Cat Relay in Conway on Tuesday, April 16. It’s their final regular-season meet. The 6A-Central Conference meet will be held in Little Rock on April 25.